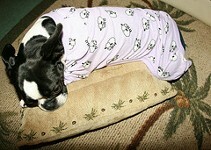 Dress your Boston Terrier in a stylish Boston Terrier dog sweaters, dog sweatshirts & dog pajamas. 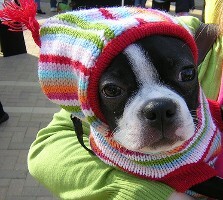 We carry of a variety of dog sweaters, dog pajamas, and dog sweatshirts that are perfect for the Boston Terrier. These dog pajamas, sweaters, and sweatshirts make great everyday wear and good for special occassions or for the times when you want to show your best friend off. **When checking out please give us the length from your dog's neck to tail & the measurement around their neck so we can send the proper size sweater in the special order instructions block. Click on the pictures below to see a full page of that particular dog outfit.